A lot of experts recommend sleeping on the floor as a remedy to spine problems since it’s one of the most natural sleeping positions? After all, our ancestors didn’t have fancy beds and pillows and sleeping on the ground is what our bodies evolved for. That’s all nice and well but as I think you all know, sleeping on the floor is not exactly an easy thing to do. Futon mattresses are one way to deal with that – they are designed to be used on the floor, fairly comfortable, and they don’t even cost all that much. Take a small journey with me today, into the world of futon mattresses. Which Futon Mattress did I Choose as the Best One? If this is the first time you’ve heard of futon mattresses, you’re not alone. But even if you have heard about futons, you might still be confused about them. Even the big brands are guilty of this, labeling products that clearly aren’t futons with a misleading name. To help you distinguish what is and isn’t a futon, I’ll give you a brief rundown of futon history. The word futon is Japanese, and refers to a traditional Japanese bed, laid out on the floor and consisting of a few different parts – shikibuton (the mattress), kakebuton (the comforter) and makura (the pillow). Of course, the idea of a futon evolved through the ages and these days, the word ‘futon’ mostly refers to just the mattress (shikibuton), even in Japan. This is what most people in the USA refer to as a futon. While futons were traditionally designed to be used on the floor, futons are also commonly used on furniture as well, especially in America. 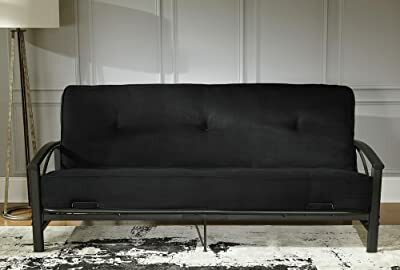 The American idea of a futon is far removed from the Japanese original, and when you say ‘futon’, most people will think of a sofa that can be folded out into a guest bed. I’m a bit of a stickler for things like this so I wouldn’t call that a futon, but I do realize that ship has sailed. Futons are quite thin for regular mattress standards – usually no more than three inches – and they’re extremely firm. This is the result of their construction process. They’re usually made mostly out of natural materials like wool, latex or cotton (the traditional choice). Layers of these materials are compressed, folded and tufted in place. Because of this, futons are more comfortable and long-lasting than they appear at first, but this also makes them difficult to maintain – but more about that later in the article. This is also what makes Japanese futons foldable, unlike regular mattresses. They are intended to be folded up in the closed during the day together with the sheet and comforter and unfolded when you need to sleep. Alternatively, they could also be used for sitting. . The issue with this, at least in the west, is that we mostly have hardwood or stone floors, while the Japanese use tatami mats as flooring. They’re similar to gym mats, but usually made from woven grass or reed, foam or rubber, and their softness provides a better base for a futon. Due to that, futons were adapted to the west as slightly thicker mattresses on a wooden base for added comfort. They still kept a bit of their original design philosophy, keeping their compactness and versatility, albeit in a different form. So, now you know what a futon is and the difference between Japanese-style and Western-style futons. But why would you get one? Well, that’s what I’m going to talk about next, so stick with me. I’ve often encountered the opinion that futons are just ‘lesser’ mattresses – cheaper, thinner and overall just worse than regular ones. I see why people would think that since that’s often how they’re marketed, but that’s not the case. Here are some unique benefits you get with a futon mattress. This is one of the main benefits of owning a futon – especially a Japanese-style one. Since you can just sleep with it on the floor and roll it into a bundle and store it away during the day, you free up a lot of floor space. Western-style futons also fold into a couch that can be used for sitting during the day, so they take up less space than a regular bed. This is especially great if you’re living in a small apartment, which is why a lot of college students use futons. Yes, I’ve mentioned this before, and it might be hard to believe, but sleeping on the floor is good for your back. A traditional mattress might feel comfy, but your body sinks into even the firmest ones, and your spine becomes misaligned. Sleeping on your back, on the floor, puts your spine in the most natural position possible, thus helping you avoid various back problems. Japanese-style futons are designed for use on the floor, which is why they’re the ideal choice if you want to start sleeping the right way. Believe me; once you get used to it, your back will thank you for it. If you have children, you know how dangerous beds can be for them. No matter how much you try to stop them from bouncing on them, they’ll try to do it anyway. Well, there’s no bouncing on a Japanese-style futon. You also can’t fall off it during the night, which is great when your child is still small and sleeping with you. It’s even better if you just have pets that are prone to biting and destroying stuff. You can just store away the futon during the day and let them into the room without any worries. Overall, even high-quality futons will probably cost less than most low-quality beds. Most of the price of a bed goes into the frame, not the mattress so by getting a Japanese-style futon and sleeping on the floor; you’ll save yourself a lot of money. Even if you get a western-style futon, you’ll still be saving a ton of money when compared to getting a regular bed. The best part is – you’re not getting a lesser sleeping experience by paying less in this case. You’re just getting a different – and in my opinion better – experience. If you’re interested in getting a futon mattress but don’t have the time for all the details, check out all the products and the relevant info about them in this handy chart! But if you’re interested in more, keep reading! If you want to know why I picked these 12 products as the best ones, take a look at my detailed reviews below. 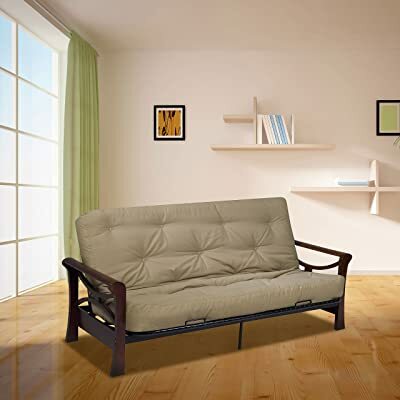 This is a luxurious looking western-style futon that is encased in a smooth cover of tufted microfiber. It feels great to the touch, and it looks amazing. It’s a single fold mattress and can fit most futon full-size futon frames. The futon itself is also full size and 75 by 54 inches in total, with a thickness of 8 inches, making it quite comfortable. The inside is filled with foam and polyester with metal coils independently encased in cotton – almost the same as a regular hybrid mattress. almost the same as a regular hybrid mattress. The mattress is a little stiff at first, but after a few days it stops being a problem, and it becomes noticeably softer. Folding it is also a bit difficult at times, and it doesn’t feel that great to sit on it. Sometimes, with futon mattresses, looks can be deceiving – a great exterior doesn’t guarantee comfort in every case. Check everything, not just how the mattress looks at first glance. 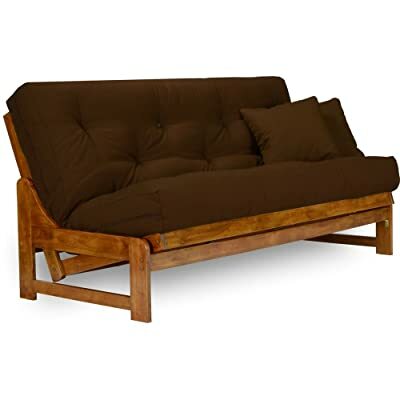 This futon is made mostly from memory foam with a cotton casing, making it rather comfortable and accommodating. The inside of it is constructed from a few different types of memory foam. It has a 1-inch piece of visco memory foam along with three 1-inch pieces of polyurethane foam. All of this is encased in a cotton mix, making it 8 inches thick overall. Due to this, it’s quite soft and conforms well to your body while staying rather breathable for a foam mattress. It also folds well and isn’t stiff at all, but it is heavy and difficult to move so watch out. The size is good, a standard 75 by 54 and it works with most frames. The main problem with it is that it smells a lot. It has a rough chemical smell when you first get it, and it takes a while for it to go away. It also absorbs smells easily, so I recommend that you use a protective mattress cover with it. 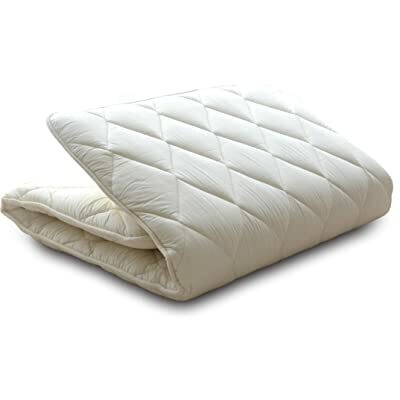 Mattress covers are a great solution to mattresses that get smelly easily. If you’re a person who sweats a lot, consider investing in one – it’s easier to wash a cover than the mattress itself. Within this mattress is a network of 540 metal coils individually encased in cotton, giving it a sturdy, firm feeling that makes it quite supportive and firm. Despite the firmness, it’s not noticeably uncomfortable. This, along with the great woven microfiber cover, makes it durable and easy to clean. For the most part, wiping it with a damp cloth is enough, and it doesn’t absorb smells. Folding it is easy and it also quickly springs back to its original shaping, so unfolding is not a chore either. However – there are some issues with the fabric when it’s folded – it tends to bunch up, and over time it gets quite wrinkly and has trouble snapping back to its original shape. It claims that it’s full size, 75 by 54 inches, but it does seem to be a bit larger. Some units are only an inch longer or wider, but others can be up to 5 inches larger – it’s inconsistent. Folding mattresses that have a spring which automatically lets them return to their folded shape are good, most of the time. However, do test them out if you can, since the spring can sometimes pose a problem and stop the mattress from staying in its unfolded shape. Ah, this is what I like to see- a traditional Japanese shiki futon. It’s good one too, with a fully cotton case and stuffing made out of polyester. Around 50% of that polyester is special and has antibacterial and anti-mite properties. Overall, the materials make it comfortable and quite durable, even though you should air it out regularly – don’t just rely on the material to keep it mite-free. Take care when buying it, since the Japanese futon sizes are a bit different than standard ones, even though they have the same name. This twin futon, for example, is only 75 by 39 inches, which is enough for one adult. It’s 3 inches thick, which might seem thin but is quite good for a Japanese-style futon. Overall, I found it to be quite comfortable, even though it seems to have a bit of a ‘hole’ in the middle that my backside constantly falls through. When you’re buying a tatami mat to go with your Japanese-style futon, try to go for one made out of natural materials. This will allow your futon to breathe better and not absorb as much moisture as it otherwise would. This is another traditional futon, though this one is made in the USA rather than Japan. That doesn’t mean it’s any lesser, though and it’s solidly constructed. The casing is made out of polyester – while the filling is a mix of white cotton, polyester, and foam. This combination makes it quite soft and comfortable while also allowing it to be quite breathable. 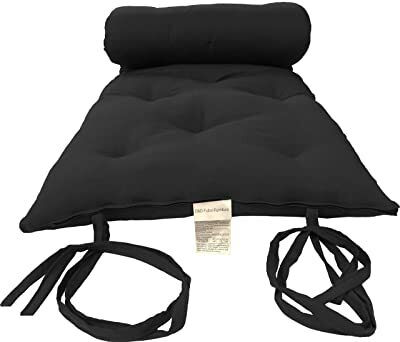 It’s also surprisingly firm for a futon, but people who need more support for their back will appreciate that I’m sure. This futon is best for side sleepers, though, since they will take up the least space when sleeping on it. It’s quite narrow, being 80 by 30 inches. There’s also a distinct chemical, factory smell to it that refuses to go away, even after months of use. Mattresses often have an unpleasant smell when they’re first unpacked, which is why you should air them out before sleeping on them. If you don’t, the smell will stick around for longer and get even nastier as the mattress absorbs your body odor. Recently, traditional Japanese-style futons have seen some success, and they are also manufactured in the USA, which is something I like to see. That means the prices get better and better. This is quite an affordable and well-made one, with a cover made entirely of polyester. It’s 3 inches thick, with a size of 80 by 54 inches – more than enough space for an adult person to sleep on. Even without a tatami mat, it seems to hold up well, and you won’t quite feel the hard floor below it as much as you would with other futons. Overall, it feels decent, but something kept bugging me. The manufacturer avoided mentioning what the filling was made from. As far as I can tell, it’s mostly foam but not of good quality. It keeps shifting around. It also seems to take up quite a bit of space when rolled up, more than similar-sized futons do. This might also be due to the filling. Always remember that, while you can replace or readjust the filling of a futon mattress you probably shouldn’t do it on your own. Try to get professional help or look up how to do it properly, or you might ruin your mattress. With this, you get both a futon mattress and a wooden frame to go with it. The frame itself is good – solid, wooden construction with 3 different positions. But the mattress is what I’m here for. Overall, it seems to be quite good – 8 inches thick, a standard full size of 75 by 54 inches and it’s filled with a mix of poly-cotton and four different layers of high-density foam. This makes it solidly supportive, though not too firm. It somewhere smack-bang in the middle when it comes to that. One of the problems with it is that the casing can’t be removed and washed separately. This might make it a bit difficult to deal with accidents that happen on it. The mattress also compresses a lot when you sleep it on it for longer than a few hours, and it can take a while for it to regain its usual fluffiness. Sometimes it’s better to get a futon mattress without a frame. Paying less to get a mattress with a frame that isn’t quite what you want is sometimes worse than paying a bit extra to buy a frame separately. With a combination of cotton, foam and metal springs, this mattress ends up being quite supportive and firm. It’s also quite sturdy and seems to be able to keep its shape even when heavier people sleep on it. In fact, it might even be a bit too firm. So much so that sleeping on it can be a bit uncomfortable if you’re not used to it. Despite the springs, it’s not squeaky at all, which tends to be a problem with lots of these mattresses. It also folds and unfolds easily, while working well in both forms. The size is a standard 75 by 54 inches, and it’s 8 inches thick – there’s no problems on that front, and it fits standard futon frames to a tee. The only other problem is some slight smell that comes from it when you first unpack it, but that goes away after a few weeks. If sleeping on a mattress is uncomfortable at first, that’s no reason to change it. Try it out for a few weeks before replacing it – sometimes your body just needs time to adjust, especially if you’ve been sleeping badly for years. At first, this mattress is quite soft while still being decently supportive, which I definitely like. That’s the result of the springs inside it combined with mostly foam and cotton-based construction. 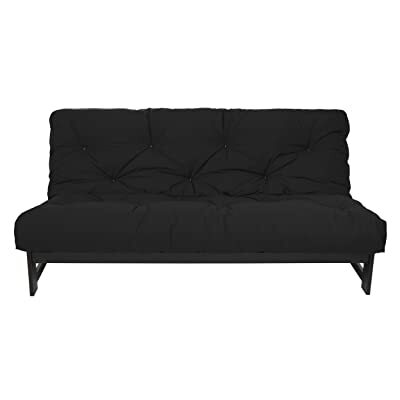 The size is a bit non-standard – 80 by 60 inches, so it doesn’t fit most futon frames. However, due to that, it offers a lot more sitting and lying space than most other futon mattresses. The main problem with this mattress is something that I’m afraid of every time I sleep on a spring mattress – the springs poke at me. Yes, the springs here are not well-position, and they can rip the fabric and poke you through it. Getting a mattress in a non-standard size is not necessarily bad – it might be exactly what you need in certain cases. Don’t be afraid to try out different things until you find something that fits. Back to another Japanese-style futon mattress – and this one is quite decent I would say. While it is only 2.5 inches thick, it is quite firm and supportive but still comfy. 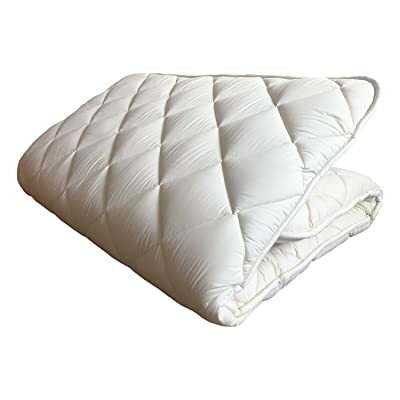 This is thanks to a combination of a polyester pad and soft filling inside of it, with a 100% cotton casing. The size is a Japanese twin long, which is 83 by 39 inches. This makes it quite long and well-suited for taller people, but it will be narrow if you’re not used to futons. When it’s folded up, it takes up little space so you can easily fit it in anywhere. It’s even more compact than most other Japanese futons. Keep in mind that this futon is non-washable. You practically need to get some sort of mattress cover for it, or it won’t last for all that long. If you have an accident on a mattress that isn’t washable, try taking them to a professional cleaner and explaining the situation. They might find a way to save it and wash the stains out if you take it there straight away. Well, if this isn’t a fancy-looking futon, I don’t know what it is. The faux leather cover looks superb, and it comes in both black and white, so it can fit into most rooms. You can’t even tell that it comes at an affordable price. But, looks aren’t everything, and you will need to sit and sleep on this thing, which is not that easy to do. It’s quite uncomfortable, and you can definitely feel the springs underneath the surface. Still, with a mattress topper, it’s decent enough, and it’s definitely supportive, which is nice for the back. The size is not standard – it’s 69 by 33 inches. Due to that, it might be difficult to find sheets for it. Overall, there’s a bit more to it than just looks, but it isn’t the greatest option. Sometimes it’s worth it to get something that’s not as good if you can improve for a little extra. Mattress toppers exist for a reason, and you should use them! This is quite a strange hybrid Japanese futon that’s not quite a futon or a tatami mat. It comes in a highly non-standard size – 47.2 by 78.7 inches with a thickness that can vary between 1 and 2 inches. It’s mostly made out of flannel – yes, you heard that right – and it has a microfiber filling with a bottom layer of polyester fiber. I haven’t seen something quite like it elsewhere. There’s one great thing about it – storing it is easy. It takes up little space, less than any other futon I’ve owned. I can see it being good in certain situations, like on a trip. Sleeping on it is definitely strange and a bit uncomfortable. It feels like there’s nothing more than a comforter or a mattress topper between me and the floor. Even with a tatami mat, it doesn’t quite work. If you stacked two or three of these, it might work, but that’s not a good solution. To top it all off, it’s not washable, so if it gets badly stained, you’ll need to get rid of it. No, not even dry cleaning works. I’m all for experimenting with different things, but sometimes the standard is the standard because it works. Try to steer clear of novelty products because they’re often not worth it. Buying a futon is quite different from buying a regular mattress – so I’ll give you a few tips to get you started. You’re probably familiar with most regular mattress sizes – full, double, queen, king and so on. I have to tell you that it won’t do you any good here since most futons have completely different size categories. These are some of the smallest futons available at sizes of around 28 by 54 inches. They aren’t quite suited for sleeping or regular use – except maybe by children. They’re good for afternoon naps, though. 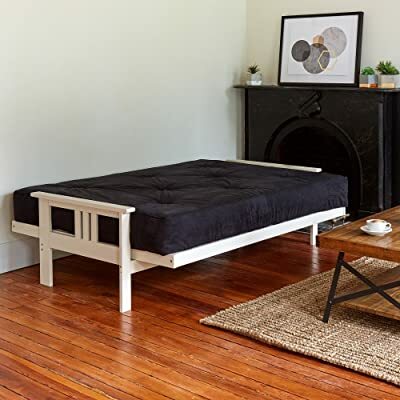 The size of a futon mattress like this is around 39 by 54 inches, but it can’t be used as a bed on its own – it requires an additional ottoman for that. This is basically the same deal as the twin split size, but the additional ottoman-sized mattress is included. This is the most common size, and it measures in at around 75 by 54 inches when unfolded. It’s quite well-suited for regular sleeping and can easily fit one adult person. Sometimes called ‘full split’ this is a smaller size, measuring in at 54 by 54 inches. If you want to sleep on it, you’ll need an additional love ottoman mattress, bringing the size up to 75 by 54 inches. Basically, this is the same as the loveseat size, but with the additional ottoman mattress included. The standard queen size 80 by 60 inches when unfolded. They can accommodate two people at most, though it can be tight. These measure in at 60 by 54 inches when they’re unfolded and require an additional ottoman to be used as a queen bed. However, they can be used as a smaller bed for a single person by themselves. This is the same as a queen split, but it comes with the ottoman mattress (60 by 26 inches) included. Keep in mind – these sizes are for western futons. If you’re looking to get a Japanese-style futon, the sizes are a bit different, though some have the same names. Single: Usually around 35 by 78-3/4 inches, this size is well-suited for one adult person, though there’s not much room to move around. Double: Around 47-1/4 by 78-3/4 inches can be used by two people or one larger person. Queen: This size is usually 59 by 78-3/4 inches, and it’s one of the largest sizes available, suited for two adult people, leaving enough space for both to move around. King: Usually the largest size available, it measures at 70-3/4 by 78-3/4 inches, and it can easily fit two or even three people on it. There are a lot of other sizes besides those, but you’ll mostly encounter these in the wild. See how much space you’ve got and how much space you need to sleep on and decide on the right size. Do You Need a Mattress Cover? Which One? Mattress covers, also called protectors, quilts, toppers, and other things, are coverings for your mattress, designed to make it look more appealing, protect it and make it that little bit more comfortable. They aren’t always a necessity, but they’re good to have, and Japanese-style futons are designed to be used with them. Western-style futons, on the other hand, don’t need a cover but it definitely won’t hurt to get one. Some futons eve come with covers included, but that’s not so common in the west. One of the most important things for a mattress cover is to be breathable. You don’t want to be sweating through the night because of it. Cotton covers are probably the best in this regard, but microfiber covers aren’t bad either. They also need to be water resistant, which will help with accidents that might occur and prevent the mattress from absorbing too much moisture through your sweat. That will help with keeping your futon in good shape. It’s a bit of extra expense, but it might be worth it. Both western-style and Japanese-style futons are quite unique and sleeping on the can be difficult if you’re not used to it. This is especially true if you prefer sleeping in certain positions and that can make it harder for you to adjust. You might have to change-up your habits if that’s the case. I’ll give you a quick rundown of how well-suited certain sleeping positions are to sleeping on both western and Japanese-style futons and you can figure it out for yourself based on that. You’ll probably have a fairly easy time accommodating to a futon. If you like to sleep in a more spread-out position, though, you might have a bit of trouble with falling off the bed. Since space is probably not that much of an issue for you, you won’t have too much trouble adjusting to a futon. In fact, you probably won’t even notice the transition. This is the worst sleeping position, and on a futon, it can be even worse. Since futons are not as thick as regular mattresses, you’ll probably have more trouble breathing than usual. You might be able to adjust to it, but it won’t be easy. Futons are quite small, so there’s not a lot of space to move around and change positions. You won’t have such an easy time adjusting to that, and you might hit yourself or fall off the bed a few times during the night. You can still adjust, but it will take time. Back SleepersYou’re probably going to have little to no trouble accommodating to sleeping on a Japanese-style futon. Even if you sleep in a more spread out, starfish-style position, you’re going to have more space than ever, and you won’t have to worry about falling off the bed. Side SleepersFor you, this will take some getting used to. You won’t be able to place your arm underneath your body anymore, and you’ll have to adjust a bit. However, sleeping on your side will still be possible. Stomach SleepersIf you happen to sleep on your stomach most of the time, I’m afraid that Japanese-style futons are not for you. Stomach-sleeping is already bad for your breathing, and this would make it even worse. Not to mention that your spine will suffer a lot. Change up your sleeping position or give up on futons. Combination SleepersThere are some positives and negatives here for you. You’ll never fall off the bed again or hit yourself on the bed frame, that’s for certain. However, if you roll over onto your stomach or onto your arm, you’ll have a worse time than on a regular bed. 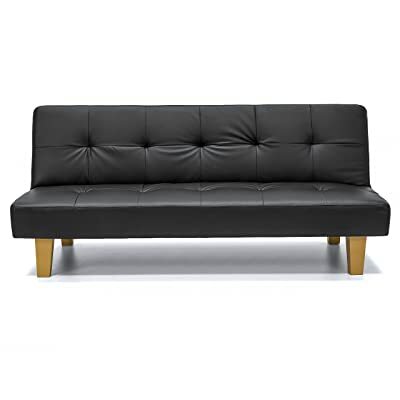 What Type of Material is the Best for a Futon? Traditionally, futons were only made using a few different materials, but over the years that changed significantly. Today, futons are made from all sorts of stuff, and it’s not all good, so it’s best to be careful when buying. Cotton – This is definitely one of the best materials available since it’s natural and causes no allergies, but it’s also expensive. You can find futons with cotton exteriors, but cotton filling is rarer. Polyester – The most common material used in futons as filling. It’s good overall, but it might cause allergies, and it can retain a lot of heat. Foam – Lots of futons use foam – both western and Japanese ones. Foam can work well but it does retain a lot of heat, it can cause allergies and sometimes it isn’t supportive enough. Metal Springs – Like regular mattresses, some Western-style futons also have springs, usually encased in foam or cotton. They can offer more support than purely foam mattresses, but the springs can be difficult to sleep on, and they can poke through the fabric. Wool – This is rarer, but higher-quality Japanese-style futons are often filled with wool. It’s completely natural, soft and offers far more comfort than cotton does. However, it can be lacking when it comes to support, and it’s difficult to maintain. It’s difficult to say which material is the best. Western-style futons have two different folding styles – bi-fold and lounger, also called tri-fold. Bi-fold futons have a single fold running through the middle of the mattress. They are larger, and their frames take up more floor space. However, they can seat more people at once and are easier to set up for sleeping while being more comfortable overall. Tri-fold futons are actually a smaller bi-fold futon with an additional ottoman mattress that can be stored below the frame. They take up less floor space and are more versatile since the ottoman can be used for a footrest or a separate piece of furniture. However, they are more difficult to sleep on. Both styles are valid choices – it just depends on what you need and how much space you have. In the west, futons are usually considered to be low-grade mattresses – cheap, uncomfortable and with a short lifetime. Don’t worry, it’s not that difficult – you only need to follow this step-by-step guide, and your futon will live to see old age. Hang your futon outdoors, in the sun when it’s not too humid. Use a carpet beater on it to get some of the dust out. Try to do this every day if possible or at least 4 times per week. If you can’t do that, putting in the dryer is also good, but not ideal. While the futon is airing out, vacuum the floor and make sure it’s as clean as possible. Pay special attention to the spot where you’ll be laying out your futon. You need to wash the futon at least once per month – but you need to wash it by hand. Machine washing and drying is not something you should do. Soak it in water and clean it with a natural cleaning solution, then place it to dry outside, in the sun. Don’t use it again until it’s completely dry or it might develop mold. If you can’t wash it and dry it on your own, take it to a dry cleaning store that washes futons. You should flip your futon once per week, so it doesn’t get too smelly or absorb too much sweat. This, along with airing it out regularly should keep it in decent shape. When you’re not using your futon, store it in a closet that’s dedicated only to it. Try to give it some space to breathe, don’t stuff it into a tight compartment. That’s the best way to avoid unwanted smell or mold. How long do futons last? Futons are notorious for lasting only a few years, especially when used regularly. However, that depends on the futon and how you treat it. Japanese-style futons can easily last for more than 10 years, and even western-style ones can stay good for up to 7 or 8 years, with proper care. Can a futon be refilled? Yes, it can, but it won’t be quite the same as it originally was. You can even do it yourself if you want, but I wouldn’t recommend it. Getting a futon professionally refilled is the best choice since it will revitalize the futon and make it almost like new. 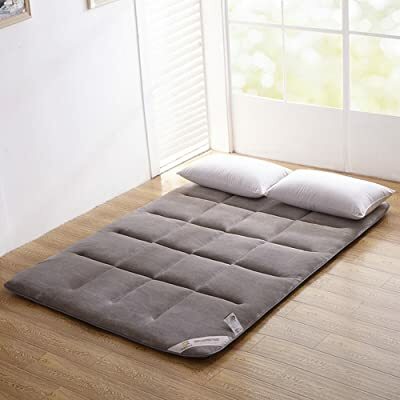 Do I need to sleep on the floor when using a Japanese-style futon? While they are intended for use on the floor, you don’t need to use them as intended. You can still place them on a wooden or metal bed frame and sleep like that if that’s what you prefer. But in that case – why even get a futon at all? I’d say you should get a regular mattress in that case. Will sleeping on a futon cause back problems? That depends on your sleeping position. If you sleep on your stomach a lot, then yes it will. If you sleep on your back or side, it probably shouldn’t cause back issues – if it does, see a doctor and stop sleeping on it. Can heavier people sleep on a futon? When it comes to western-style futons, no, that’s probably not a good idea – they are made for smaller and lighter adults. Japanese-style futons, on the other hand, are well-suited for heavier people and will probably help with their back problems and sleep apnea. No, there are premium futons out there, made from high-quality materials with superb construction. Such futons can even cost a few thousand dollars. Still, even most high-grade futons are cheaper than most beds, so you’d still be on the up and up if you get one. What is the difference between a futon and a tatami mat? I’ve seen this recently – some manufacturers selling tatami mats under the ‘futon’ label or calling futons tatami mats. The difference between the two is huge. Futons are mattresses while tatami mats are like gym mats and are usually used for flooring in traditional Japanese houses. The confusion comes from tatami mats often being used as a soft base for futons in Japan, but that’s just a byproduct of them being used for flooring. You can use a futon without a tatami mat, and tatami mats are not made to be slept on without a mattress on top of them. The Final Word: Which Futon Mattress did I Choose as the Best One? There’s more to know about futon mattresses, but I’m sure this is more than enough for you to decide if you want one or not. Trust me, it can be difficult to transition to it, but it’s worth it in the end. There’s just one more thing left – to give you my pick for the best futon mattress on the market. 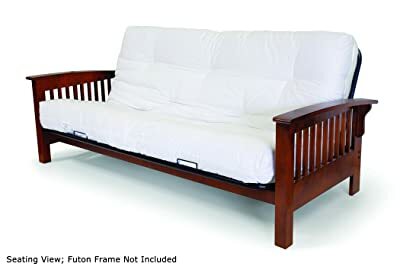 As far as I’m concerned, that would have to be EMOOR Japanese Traditional Futon Mattress since I prefer Japanese-style futons and this is one of the best here. That’s about it for today – come back next time for more!